A journal of my rather chaotic programming projects. I'm sure everyone has had an awesome picture lying around on their hard drive for what seems like forever, with a gibberish file name and no clues as to the source. Most people would simply navigate to a site like TinEye and use their awesome service to identify the image and find a source. Not you, you're interested in building some kind of software hacked together with ducktape and string, or else why would you be reading this? I'm going to be flying by the seat of my pants for this series, and I'm giving very little forethought to future posts. Things probably will be changing dramatically as I progress through this project, so I'm going to apologise in advance if everything isn't as contiguous as it should be. To build this monstrosity, I'm going to use a couple of interesting projects: pHash and py-pHash , django and django-orm, and PostgreSQL with the smlar extension. I won't be going over django or PostgreSQL, so if they are foreign to you, take some time to learn about them. To understand pHash, you'll need a basic understanding of hashes. If you have no idea what they are, go and check out the hash function page on wikipedia. The Coles Notes version is that a hash function transforms an arbitrarily-sized input into a smaller fixed-size output. On the left we have our images, and on the right, the pHash for the image. Each red digit indicates a nibble that differs from the pHash of the original colour picture. Notice how the colour and greyscale images have very similar hashes, while the third picture has a dramatically different hash. 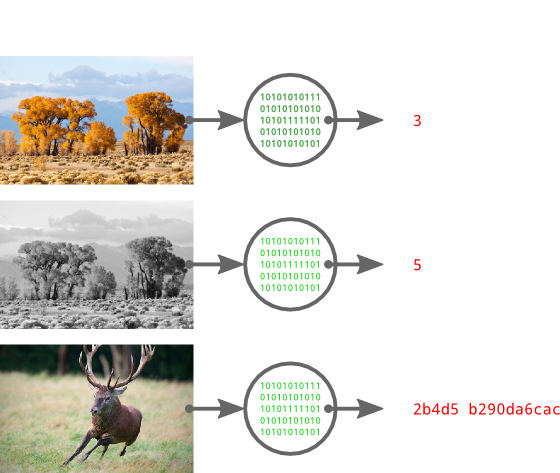 By now, you can probably see how a perceptual hash would be useful: to find images similar to A, we compute the hash for A and search for all images within a threshold distance. py-pHash is a Python wrapper for the pHash library, which will make integrating it with django much easier later on. Django-orm is a collection of 3rd-party extensions to django's already pretty awesome database system. It adds support for a metric tonne of new database features, like negated F expressions and full text search, but the most interesting feature it adds to django is the PostgreSQL specific ArrayField. The smlar extension uses arrays extensively, so having support for them in django is essential. Smlar is an extension for PostgreSQL built by Oleg Bartunov and Teodor Sigaev. It allows you to make effective similarity searches in PostgreSQL databases on pretty much any kind of data, as long as you can put it in an array. Alexey Vasiliev goes into a lot more depth on similarity searches on his blog, including some example code, but basically the relevant information is that smlar adds efficient similarity searches and indexes. We'll be using smlar to find similar hashes, which will let us find similar images very quickly. I'm running Ubuntu 12.04, so my instructions are going to be very biased towards (read: only for) Linux. Convert the instructions to use the package management system of your choice! I'm using the standard Python that ships with Ubuntu, which at the time of writing is 2.7.3.
sudo -u postgres psql -c "CREATE USER lostpic WITH PASSWORD 'password1'"
I'll be using virtualenv to manage a separate Python environment to make deployment easier. This step is optional, but recommended. Don't forget to edit urls.py to enable the admin. In the next instalment, we'll be building the models to store picture information and writing the functions to look up pictures by similarity. If you've been around me in the past couple of days, you've probably heard me talking endlessly about robots, and possibly PyPy, and my trials and tribulations with RPython. I've been working pretty hard on building something fun that isn't a website, and I think I've succeeded, at least at entertaining myself. A little bit of back story would probably be useful here. I first got interested in programming when I read about Java, back in the early 2000s. I saw a magazine in a news stand proclaiming the awesomeness of Sun's baby, and had to buy it. Thankfully as a ten year old, my money was practically non-existent and I was unable to acquire it. I forgot about programming for months, until Christmas rolled around and my parents bought me Borland's C++ with a Sam's Teach Yourself C++ in 21 days. After miserably failing to wrap my brain around pointers, I began looking at other ways to program, and I eventually discovered AT Robots, Corewars, and other awesome games. These games, especially Robocom, are what inspired tonight's project. The game is played on a 100 by 100 grid where the edges wrap around, torus style. Robots are programmed in a very simple assembly like language that is interpreted by an RPython program. The game state is transferred to the user interface, which is written in full Python with wxPython and Cairo. This simple program builds copies of itself and sends them on their merry way around the board.